The Barcelona El prat Airport is located in El Prat de Llobregat, around 15km to the south of Barcelona. Thanks to the short distance between the airport and the city and the excellent transport links, the journey should be quick and easy, and there are various ways of getting to and from the airport. Following the huge increase in air travel and tourism in Barcelona over the years, it’s been necessary to carry out extensive refurbishment to the airport, including a huge development, the creation of a new terminal (now called T1). From Barcelona you can fly direct to nearly every city in Spain served by an airport, as well as to the capitals and main cities in most of Europe. Direct flights are also available to Cairo, Tangiers, Tunis and many African countries. There are a large number of flights to Asia, Oceania and North and South America, although in many cases you will have to go via another airport. Air traffic is shared between the two terminals, Terminals 1 and 2, although the vast majority of flights are now served by Terminal 1. Terminal 2 is currently undergoing refurbishment, but it is operational, and it’s divided into three areas: T2 A, T2 B and T2 C. The distance in between them isn’t far at all, and it shouldn’t pose a problem getting from one area to another on foot, but it’s important for you to check which area you need to go to, so that you’re not having to carry luggage across the airport. Terminal 1 serves the vast majority of airlines that operate both national and international flights. It’s important to note that the airport’s two terminals are 4km away from each other, so we’ll show you the best way of getting between them, as well as getting to the city from both terminals. 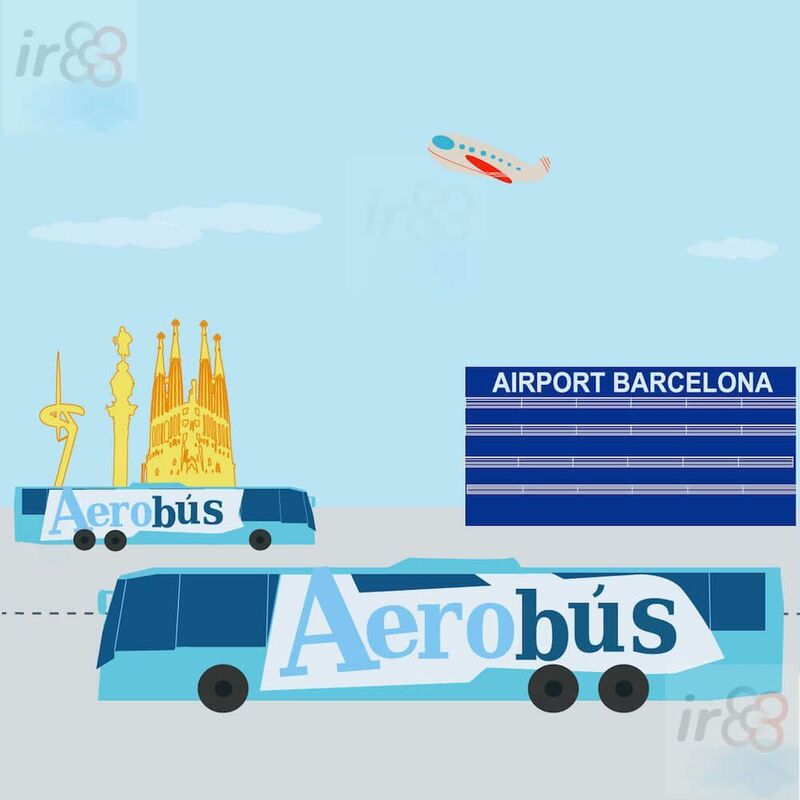 To get to the city centre from either Terminal 1 or Terminal 2 you can take the Aerobús service (A1 or A2 depending on which terminal you fly into), or you could take the local bus number 46, run by the Transportes Metropolitanes de Barcelona (TMB). The Aerobús A1 connects the city centre with Terminal 1, whereas the Aerobús A2 does the same with Terminal 2. Both provide a shuttle service, which could be practically door-to-door depending on where you’re staying, 365 days per year. We say that it’s practically door-to-door because as well as the stop in the heart of the city centre (Plaça de Catalunya) and the stop in the terminals, during the journey there are two more stops to drop off or pick up travellers. Price of one-way ticket: €5.90. Price of return ticket: €10.20. Free travel: for children under the age of 4. First bus in the morning from the airport: 06:10. Last bus at night from Plaça de Catalunya: 01:05. First bus in the morning from Plaça de Catalunya: 05:30. Last bus at night from the airport: 00:30. Frequency of buses: every 5 minutes (but every 10 minutes first thing in the morning and last thing at night). DON’T CATCH THE WRONG AEROBÚS! When returning to the airport from the city centre, make sure you catch the right Aerobús for the terminal that you’re going to. It’s easy to get this wrong, since the two bus stops are right next to each other in the Plaça de Catalunya. If you catch the wrong one by mistake, you can get off and change at one of the stops during the journey, or when you arrive at the airport you can catch the Bustransit T1-T2 service, which runs a regular shuttle between both terminals. First bus in the morning from the airport: 06:00. Last bus at night from Plaça de Catalunya: 01:00. Frequency of buses: every 10 minutes (but every 20 minutes first thing in the morning and last thing at night). You can buy tickets with your credit card from the machines located next to the stops at the airport and the Plaça de Catalunya, or you can pay by cash (maximum change given is €20), either on the bus itself or from the staff you’ll sometimes find at the front of the queue. 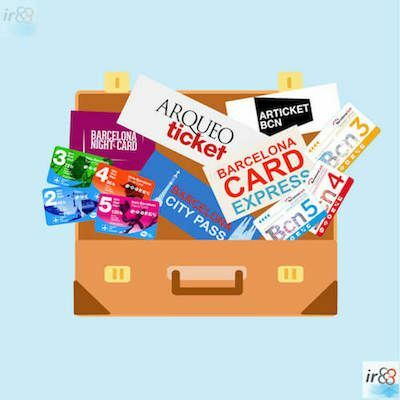 If you’d like to avoid possible queues (which might be ideal for you if you’re travelling with your family or in a group), an excellent option would be to buy your Aerobús ticket in advance online, rather than on the bus or at the ticket machines next to the bus stop at Plaça Catalunya and in the airport itself. The TMB’s public transport tickets (eg T-10, T50/30 etc) aren’t valid on this service as it’s run by a private company. The return ticket is valid for 15 days after buying it. More information about the Aerobús. Speed: It’s a very fast and direct mode of transport in between the city centre and the airport. Comfort: there are designated spaces in which to put your luggage. Price: it’s quite a lot more expensive than the local bus number 46. The local bus 46, run by the TMB, also connects the city with both airport terminals. It only operates during the day (approximately 06:30 to 22:30, depending on the stops). It’s also possible to do the journey between Terminal 1 and Barcelona city centre at night-time, thanks to the night bus N17 (from 23:00 to 05:00 approximately, depending on each stop), whilst the N16 night bus connects the city with Terminal 2. Price: a single ticket costs just over €2, so it’s much cheaper than the Aerobús. Integration with TMB tickets and passes: you can use the TMB’s usual tickets and cards (T10, T50/30), the daily Hola BCN! pass, and the Barcelona Card. DJourney time: as it’s a local bus with many stops, the journey time could be much longer, depending on where you’re going in the city centre. SLack of space: if you’re traveling with large suitcases, you might find the journey a bit uncomfortable as there aren’t designated spaces in which to leave them. Since February 2016 Barcelona Airport has been connected with the city by Line 9 of the Metro system. 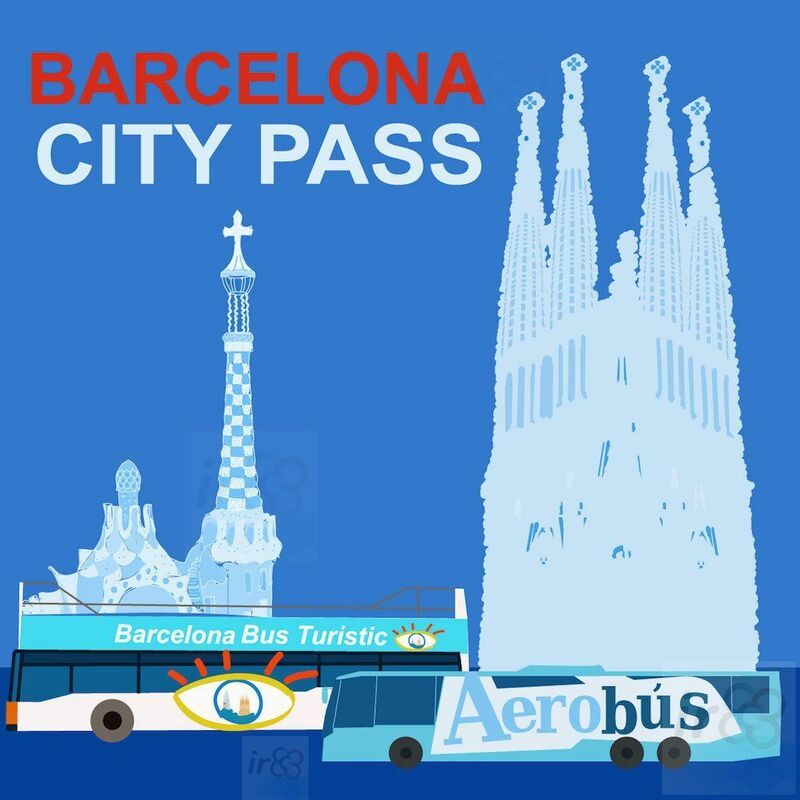 For the journey between the airport and the city you can’t use a normal single ticket or the T-10 card; you’ll need to buy a special ticket, that costs €4.50 per journey, or be in possession of one of the transport passes that includes the journey in between the city and Barcelona’s El Prat Airport. Stations at the airport: Terminal T1 and Terminal T2. Journey time to Terminal 1: 32 minutes. Journey time to Terminal 2: 27 minutes. Metro Line: 9 Sur (9 South). Price: €4.50 per journey (single ticket). Free with the Hola BCN! card. Timetable: you can consult the timetable here. Travel by metro at last: After a lifetime of managing without a direct connection, now it’s a great advantage to be able to travel from the city to the airport by metro. Standard single ticket and T-10s aren’t valid: Although the price of €4.50 isn’t expensive, it’s somewhat inconvenient that the single tickets and T-10 tickets aren’t valid for the journey. The Metro line doesn’t reach the city centre: In order to get to the heart of the city centre you’ll need to change to another line, which is especially inconvenient if you’re travelling with luggage, and will probably increase your journey time to at least 45 minutes. There’s still only a train service between Barcelona and El Prat airport’s Terminal 2. The train station is around 5 minutes’ walk from the terminals (except for T2C, which is a little further away). 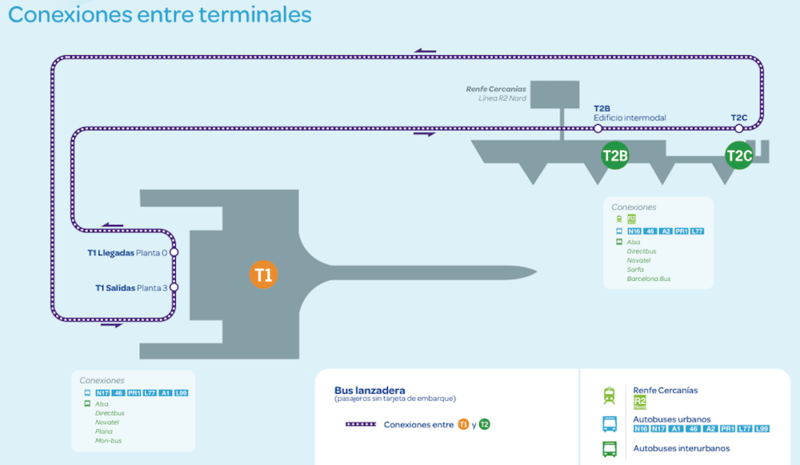 If you need to get to Terminal 1, when you arrive by train at Terminal 2 you can catch the Bustransit T1-T2 (the bus stop is in between T2B and T2C. Stations that the train stops at: Sant Andreu Comtal, El Clot – Aragò, Passeig de Gràcia, Barcelona Sants. Journey duration: 20 – 35 minutos 25-30 minutes (depending on which station you’re getting on/off at). Price: 4.10€ price per journey (single ticket). Free with the Hola BCN! card. * Details of prices, journey time and frequency are approximate. Cheaper than the Aerobús: The ticket is cheaper than that of the Aerobús. You can travel on the train free of charge if you have a Barcelona Card or a Hola BCN! Card. If you don’t have one of these cards and you’re traveling in a group, we recommend that you buy a T-10 that covers 2 zones, which you can share between you, rather than buying individual tickets, which should work out cheaper.. Speed: If you’re going to Terminal 2 it’ll be fast and comfortable. Terminal T1: Although it shouldn’t take you too much more time or trouble, it’s slightly inconvenient that in order to travel to or from Terminal 1, you’ll have to catch the Bustransit T1-T2 to get in between the two terminals. In the Arrivals areas of T1, T2A and T2B there are taxi ranks, so you’ll be able to catch a taxi without having made a prior reservation. You can also reserve a taxi or shuttle service in advance, which could be a good idea to avoid possible queues, especially during the busy summer months, or during holiday times such as Easter or Christmas. Journey duration: 20 minutes (airport to the centre of Barcelona). Supplement: A taxi pickup from the airport will incur a surcharge of €4.20. * Prices and journey duration are approximate, as of course they will vary according to where you’re going in the city. Many hotels offer transfer services between the airport and their hotel. There are also various private companies that offer this service, which is often used by groups and people travelling for business. If your hotel is near to the airport, or if you’re travelling in a group, it’s likely to work out cheaper to use one of these transfer services. Convenient: it’s the most convenient form of transport, as the driver will take you directly to your accommodation. The price: the only disadvantage of taking a private transfer is that it’s likely to be much more expensive than the other two forms of transport, although this could be significantly reduced if you’re travelling in a group. If there’s no traffic, it shouldn’t take more than 25-30 minutes to get from Terminal T1 or T2 to the centre of Barcelona. All the car hire companies at the airport have offices in Terminal T1 and T2. To hire a car you can go to any of the offices and complete all the necessary paperwork there. Another option is to make the reservation online in advance; this is what most people do, as it means that you’ll be able to get the kind of car you want, especially in the busy summer months. You might also benefit from online offers by booking in advance. DO YOU REALLY NEED TO HIRE A CAR? 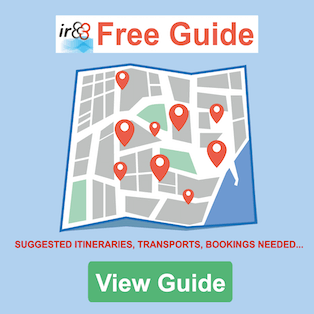 If you’re spending your entire holidays in the centre of Barcelona, or even if you only have plans to make a couple of trips up to the Costa Brava or other nearby towns, the likelihood is that you won’t need to hire a car. However, if you’re planning to make trips out to explore some of the more remote villages in Catalunya, or even take a tour of the region, you’ll probably benefit from hiring a car, as it will give you much more independence than with any form of public transport. If you’re lucky enough to have people to take you to the airport, you’ll be able to park the car for a couple of minutes while you unload your luggage and say your goodbyes. Or you’ll be able to park the car (in terminal T1 or T2), and leave it in the car park for as long as is necessary, whether in the multi-storey car park or in the open air car park. If you need to leave your vehicle (car or motorbike) at the airport for a day or more, it’s best to park in the long stay car park, and to reserve your parking online in advance, as you’ll end up saving a considerable amount of money. Price for 1 hour: €2.50. Price for 1 day (long stay car park): €17 (with advance reservation) or €19 (without reservation). Price for 3 days (long stay car park): €28.00 (with advance reservation) or €45.00 (without reservation). 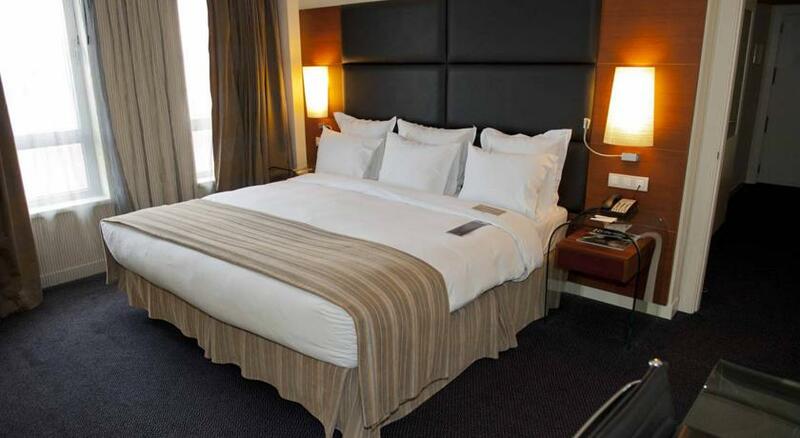 Price for 5 days (long stay car park): €35.00 (with advance reservation) or €65 (without reservation). 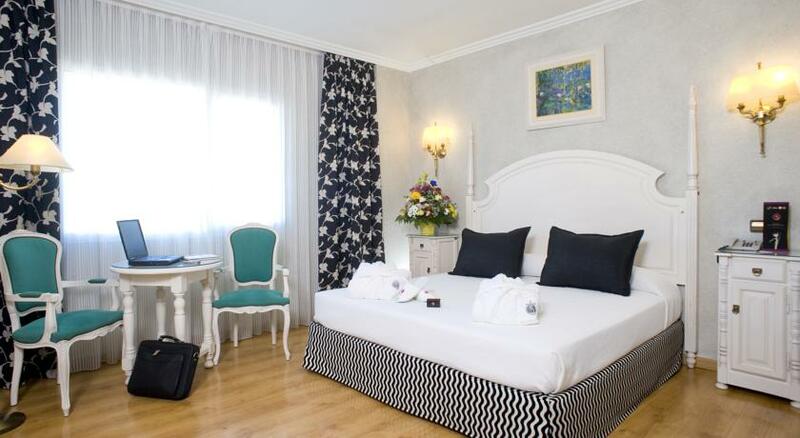 Price for 1 week (long stay car park): €45.00 (with advance reservation) or €88.00 (without reservation). * Prices are all approximate. To make the 4km journey in between the two terminals T1 and T2, there are two possible options – the Bustransit T1-T2 and the shuttle bus that takes you to the long stay car parks. The Bustransit T1-T2 is a free bus that operates continuously, taking you between the two terminals in just a few minutes. Terminal T1 – 3rd floor (Departures). Terminal T1 – ground floor (Arrivals). Terminal T2 B – Departures. Terminal T2 C – outside the terminal building. This continuous service links Terminals T1 and T2 with the airport’s long stay car park. Parking area G (which is also the stop for the hotel shuttle buses) oustide T1. Terminal T2 B outside the ‘Bloque técnico’, a separate building that sits in between T2B and T2C. The long stay car park. The airport’s two terminals, Terminals 1 and 2 (T1 and T2), provide all the services that you would expect of a major city’s international airport, as well as ensuring the safety of its passengers. From outside of Spain: +34 91 321 10 00. Many visitors to the city will need to stay in a hotel close to the airport for whatever reason, whether it’s for business, personal preferences, or due to flight delays. There are plenty of hotels that are near to the airport, and many of them offer transfer services from the airport or will arrange a taxi for you if you need one. 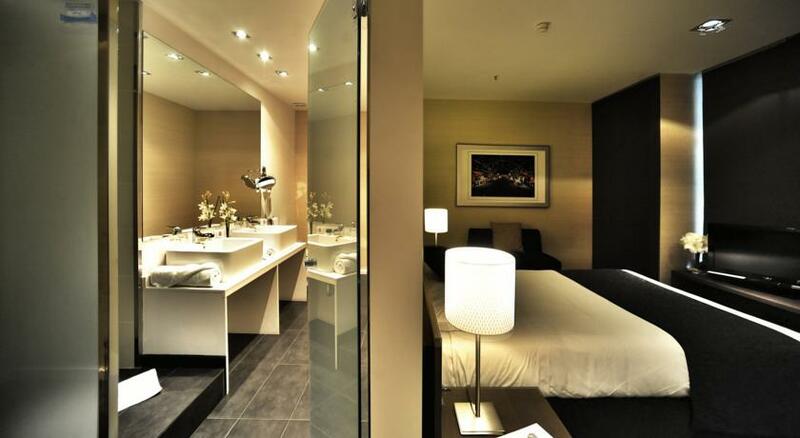 Below we have listed 3 recommended hotels for you, but if you want more options you can use our search engine.